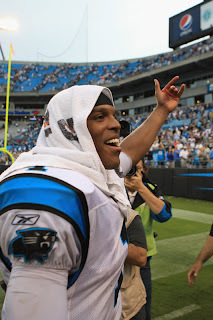 For the second straight year, the top overall NFL draft pick was voted NFL Offensive Rookie of the Year and this year's recipient was Panthers quarterback Cam Newton. Newton breathed life to this woebegone franchise with an awesome 2011, becoming the first rookie quarterback to throw for over 4,000 yards and rush for 500 yards. He also set a record in rushing touchdowns for a quarterback with 14 and helped the team improve from 2-14 to 6-10. And if he got help from his defense, they would have been in the mix for the playoffs.